El Panecillo is located between southern and central Quito. It is high in the middle of the city like a natural lookout. The aluminum statue of the Virgin Mary was introduced to the Panecillo in 1976 and was encouraged by the Virgen de Quito, which can be seen in the Church of St. Francisco. From its hill location unique view of the city can be seen. For the best views, get here early in the morning (around 10am), before the clouds settle in around the adjacent mountains. 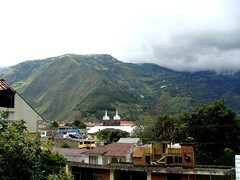 On a clear day, Cotopaxi can be seen in the distance. This is comparatively a quick ride from Old Town, and a taxi should only cost about $3 (£2) each way. A half-hour is all you'll need to take in the wonders. To visit the view point on foot, one of the main roads can be used which starts in the Garcia Moreno Street. The buses go down García Moreno and Chile streets; you have to get the bus route Altamira – Cima de la Libertad or Jesus del Gran Poder- Cima de la Libertad bus route. "